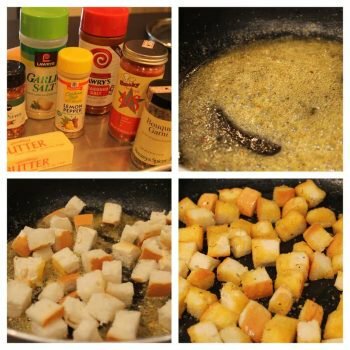 the perfect croutons for any salad. take your salad from good, to amazing! enjoy. Lightly spray a cookie sheet with cooking spray. Cube the bread to the size you desire. Add the bread and stir until the bread is well coated. Spread the buttered bread evenly onto the cookie sheet. Place in the preheated 325 degree oven. Turn off the oven, but do NOT open the door. Leave the croutons in the oven at least two hours or overnight.